According to present knowledge, the family Ephydridae (shore flies) includes some 1800 species worldwide, but it is only rarely that one of the higher taxonomic units within the family, together with all its constituent species, has been the subject of a comprehensive systematic study. In the course of a phylogenetic analysis of flies of the subfamily Ilytheinae, the author has examined the holdings of museums in many countries and the collections of many individuals. This study, involving 3290 specimens, has resulted in numerous taxonomic changes at all levels (new species, new combinations, new synonymies among genera and species). A total of 56 species have been recognised and characterised, and important diagnostic characters (male genitalia and/or wings) have been illustrated. A key enables the world species of Philygria to be identified. 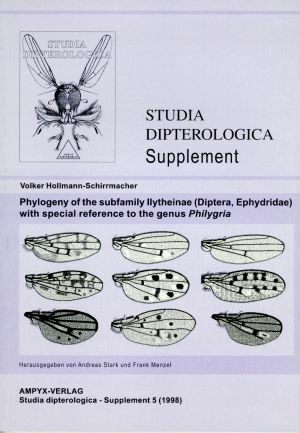 This Supplement of the journal Studia dipterologica is an English translation of the doctoral thesis successfully defended by the author at the University of Osnabrück. Die Familie der Sumpf- oder Weitmaulfliegen (Diptera, Ephydridae) vereint nach heutigem Kenntnisstand weltweit etwa 1800 Spezies. Nur selten waren bislang höhere taxonomische Einheiten der Ephydridae mit ihrem kompletten Arteninventar Gegenstand umfassender systematischer Untersuchungen. Im Rahmen der Bearbeitung der Phylogenie der Fliegen der Unterfamilie Ilytheinae sichtete der Autor die Bestände von Museen in zahlreichen Ländern und die Kollektionen vieler Sammler. Die Untersuchung von insgesamt 3290 Individuen hat zahlreiche taxonomische Veränderungen zur Folge (Neubeschreibungen, Neukombinationen, neue Synonyme auf Art- und Gattungsebene). Insgesamt werden 56 Arten charakterisiert und wichtige diagnostische Merkmale - Genitalien der Männchen und/oder Flügel - abgebildet. Ein Schlüssel ermöglicht die Determination der Philygria-Spezies der Weltfauna. Beim vorliegenden Supplementband der Zeitschrift Studia dipterologica handelt es sich um die englische Übersetzung der an der Universität Osnabrück erfolgreich verteidigten Dissertationsschrift des Verfassers.